Orange Beach AL Beach-front condominium home for sale at Phoenix West II. 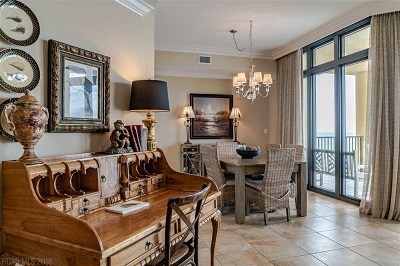 3BR/4BA gulf front condo that features granite counter tops in kitchen and bathrooms, tile throughout the unit, stainless steal appliances, large climate controlled storage unit, and much more – all accompanied with breathtaking views of the Gulf of Mexico from your balcony! This unit is tastefully decorated and makes for a great rental unit! Enjoy all the amenities that a Phoenix has to offer: lazy river, indoor and outdoor pool, lighted tennis courts, exercise room, sauna’s, hot tubs, covered parking.. Just to name a few! This unit is on Brett Robinson’s rental program. Orange Beach is a coastal community situated between Gulf Shores and Perdido Key, and boosts the largest charter-fishing fleet in the Gulf of Mexico. Orange Beach has miles of white-sand beaches and numerous public parks – the inland bays and bayous just north of Perdido Pass provide for ample water-sports and outdoor activities.